Gluten free rice and gluten free noodles are only a couple of the many possible side dishes that can make a gluten free diet interesting. Corn dishes are a staple in many cultures, as well as roots and other starchy vegetables such as plantains and cassava. There is a fascinating documentary about noodles called Noodle Road produced by KBS America. It travels through the history of noodles, showing that they have traditionally been made from all kinds of starches. You can watch portions of it here, and on YouTube. 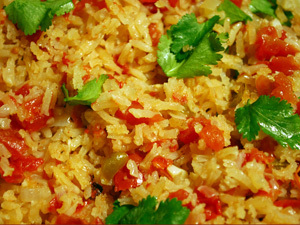 Below are recipes for some gluten free rice dishes from around the world to get you started. You’ll also find some great recipes and suggestions by other visitors here, and can add your own if you don’t see one of your favorites listed. Dish of Rice, Noodles, or Another Grain? Do you have a story about finding some great traditional starchy side dishes that are G Free? Potatoes and other starchy vegetables like plantains or cassava would be great to know about too. Please share, we would love to hear about them... And try them!